Seamlessly integrate TestComplete with your agile environment to facilitate faster delivery cycles. Agile testing is an iterative testing methodology designed to foster quick results from collaboration among software teams, frequent feedback loops, and testing simplicity and flexibility throughout a software development lifecycle. Having the right tool stack to complement your agile testing efforts will empower manual and automated testers to accomplish faster, scalable results. TestComplete features are critical for your agile environment. TestComplete enables continuous testing, fosters collaboration across teams, and provides detailed, comprehensive error logs for faster results with agile testing. For scalability with agile testing, TestComplete seamlessly integrates with your agile framework and environment. The tool helps you manage automated GUI web, desktop, and mobile tests across physical and virtual machines and hundreds of environments for all your new and regression tests. TestComplete accelerates agile testing cycles with continuous testing. TestComplete enables software teams to easily build automation frameworks with the tool’s open architecture. Execute TestComplete tests as a part of your nightly test runs or batch and build processes directly in various CI/CD tools after execution and import and combine your test sets in various ALM tools, which then allows you to schedule, provision, and deploy automated builds for continuous delivery. Speed up feedback loops and allow your QA teams to collaborate with all your agile development teams. With TestComplete, you can directly integrate, configure, and run 3rd party unit testing frameworks and tools, including Selenium WebDriver, JUnit, TestNG, and xUnit. 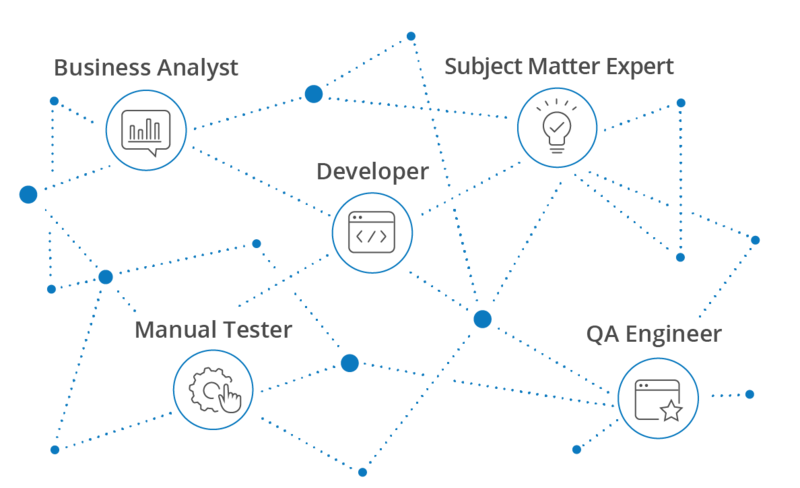 Leverage our suite of products to ensure complete test collaboration by managing both your API and UI tests and both your manual and automated functional tests in one location. TestComplete equips your team with detailed reports and snapshots for easy reproduction of issues and faster time to resolution. You can generate event logs and dump files in just a few clicks for comprehensive analysis on your application behavior, including running process threads, CPU registers, modules used by the process, call stacks, and DLL names, making it easier for you to send packaged results to QA managers and key stakeholders that meets your agile testing needs. Different software teams use different tools and TestComplete is key to connecting your ecosystem of applications. TestComplete integrates and supports over 100 controls and applications to fit into your agile testing environments. With TestComplete, you can track changes, merge modifications and resource previous file versions with source control tools like Git; you can push defects to bug tracking software like Jira, Bugzilla, and MS TFS; and you can execute TestComplete tests as a part of your nightly builds with continuous delivery tools like Jenkins. Get access to over 1,500 real test environments anytime, from anywhere, through our CrossBrowserTesting integration to maximize your agile testing efforts. Run automated UI tests concurrently across the latest devices, browsers, resolutions and physical and virtual machines using our lightweight runtime engine. Get detailed reports across machines along with actionable metrics to stay up-to-date on the health of your application and understand which tests passed and which tests failed. TestComplete allows teams to scale your agile testing efforts with one automated network test suite. With TestComplete, you can directly integrate, configure and run your regression tests based on priority and leverage distributed testing to give you the flexibility you need for your agile environment. Manage your Network Suite directly via the TestComplete UI, keeping agile testing simple and easy for any tester.